There might be 176 long days to go before the 2018 Masters, but there is good news on the horizon for golf lovers in the shape of the Druids Glen Winter Alliance. Sponsored by Titleist, this new winter series tees off at Druids Glen on 23 October for the first of 16 singles stableford competitions open to both amateurs and professionals. Alternating with its sister course, the equally stunning but no less exacting Druids Heath, the Winter Alliance offers golfers a chance to keep their games razor sharp in glorious surrounds between now and the Grand Final on March 18. The new event won't just keep your game ticking over nicely before the arrival of spring, but it will also give you the chance to see first hand the many enhancements made to two of Ireland’s best parkland courses for a fraction of the usual green fee. With weekly prizes (or cash if you’re a professional) up for grabs and an Order of Merit deciding the Top 20 who will join the 16 weekly winners in the Grand Final, no other winter event offers so much quality or variation. The Druids Glen Winter Alliance will run on Mondays over two eight-week periods either side of Christmas — from the 23 October to 11 December 2017 and from 15 January to 2 March 2018 — and it offers unbelievable value for money. While it can cost €125 to play Irish Open venue Druids Glen or €50 for Druids Heath, those who pay the €30 entry fee to have their results count in the Order of Merit get reduced entry fees at both venues for the duration of the 16-week series. Amateurs will pay just €40 per game at Druids Glen and only €25 at Druids Heath while it’s just €20 for PGA professionals at either venue. Of course, amateurs (€50 Druids Glen, €30 Druids Heath) and professionals (€30 for Druids Glen, €25 Druids Heath) can simply play occasionally and forget all about the race to the Grand Final. “The courses hold up extremely well to the Irish winter weather because of the high standard of the initial construction,” explains Golf Manager Marcus Doyle. Hailed as the Augusta of Europe when it first opened in 1995, Druids Glen Hotel & Golf Resort remains true to those lofty standards of excellence more than two decades after it brought Irish golf to new heights. Perhaps it's the echoes of those cheers for the mesmeric Seve Ballesteros as he fought the gremlins in his game like a modern day Don Quixote and saw parts of the pristine Druids Glen course last visited by the mysterious druids themselves yet still put Colin Montgomerie to the sword in that unforgettable Seve Trophy duel in 2002. Those who were at Druids Glen in 1999 will remember current Masters champion Sergio Garcia, then just 19, flamboyantly introducing himself to the world by winning the Murphy's Irish Open by three shots. Much has happened in the intervening years with the opening of the Pat Ruddy designed Druids Heath course in September 2003 — its front nine offering wonderful views of the Irish Sea and the back nine nestling in the Wicklow Mountains — a fitting addition. Rolling fairways, natural rock quarries, lakes, trees, streams, gorse, pot bunkers and gently undulating greens are just some of the characteristics of this links style, heathland course. It's the perfect foil to the sylvan beauty of "The Glen", which was created by Ruddy and the brilliant amateur Tom Craddock. 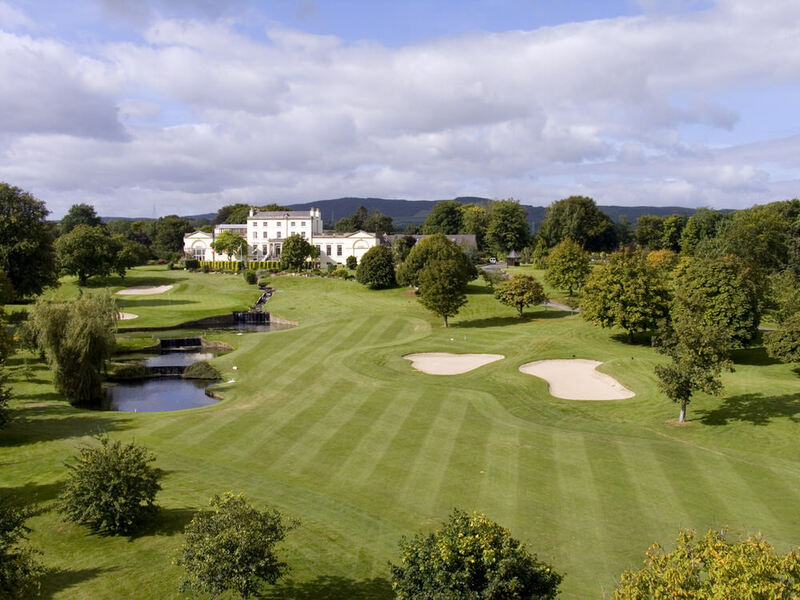 There's something inescapably magical about this 36-hole resort, set in glorious natural beauty in the foothills of the Wicklow Mountains at Newtownmountkennedy. And it has only improved in recent months with the resort taking on a full-time gardener and a horticulturalist to make a place of great beauty even more memorable and playable. “We have removed some trees and trimmed others back to improve the playability of the course and improve the pace of play,” adds Doyle, who will celebrate three years in charge in March. The Titleist sponsored Winter Alliance will cap a hugely positive year for Druids Glen, which has become the choice venue for some high-profile golfing events. A new partnership with Rugby Players Ireland attracted huge numbers to Druids Glen for their annual golf day. The annual Jack & Jill Golf classic, the Great Irish Golf Event, the Irish Distillers Golf Day, the Paul McShane Golf Day and recent Irish Open Matchplay Finals (soon to be televised by Eir Sport), all received positive feedback in terms of course condition and service levels. Open competitions in partnership with Audi Centre saw players attempt to win a new Audi A4 for a hole-in-one at the iconic 17th at Druids Glen with Castleknock’s Darren Healy coming closest by leaving a 5-iron hanging over the lip on the famed “island” hole. The Audi Summer Series attracted more than 500 players with Charlesland three-handicapper Stephen Young crowned 2017 champion at the Grand Final. Druids Heath has had its best year to date with investment in the course leading to a dramatic rise in membership with over 130 ladies and 500 men now calling the Heath home. You can check out both courses up close during the Druids Glen Winter Series and possibly contend for the overall grand prize on March 18. “The Alliance alternates between Druids Glen and Druids Heath with eight outings on each course,” Marcus adds. “We will allocate points for top finishes at each venue so that one venue does not carry more weight than another. There are 10 points for a win, nine for second all the way down to one point for a tenth place finish. "So while each will be a singles stableford event, it’s the points awarded for a top-10 finish that count in the Order of Merit, not the actual stableford points you score. Your best eight scores then count in the Order of Merit so there is nothing to stop you playing all your events at either Druids Glen or Druids Heath rather than mixing them up. With 1,110 members at Druids Glen and Druids Heath, the resort is clearly doing a lot of things right. 8 events on Druids Glen and 8 events on Druids Heath. Druids Glen: Mondays - 23 Oct, 6 Nov, 20 Nov, 4 Dec, 15 Jan, 29 Jan, 12 Feb, 26 Feb.
Druids Heath: Mondays - 30 Oct, 13 Nov, 27 Nov, 11 Dec, 22 Jan, 5 Feb, 19 Feb, 5 Mar. Grand Final, Druids Glen, Sunday, 18 Mar. The top 20 players from the Order of Merit will join the 16 weekly winners in the Grand Final on the Druids Glen course in March 2018 sponsored by Titleist. The best eight scores will count towards Order of Merit victory. The format is singles stableford from white tees (red for ladies) on both courses. For further information contact 01-2870814 or email aaron.byrne@druidsglenresort.com.